Police on Wednesday, Dec.14, said the New Hyde Park teen made up the story about being verbally attacked on a New York City subway train. Read more here. NEW YORK -- New York City police are looking for three men who taunted a Muslim woman aboard a subway train, yelling “Donald Trump” and calling her a terrorist. 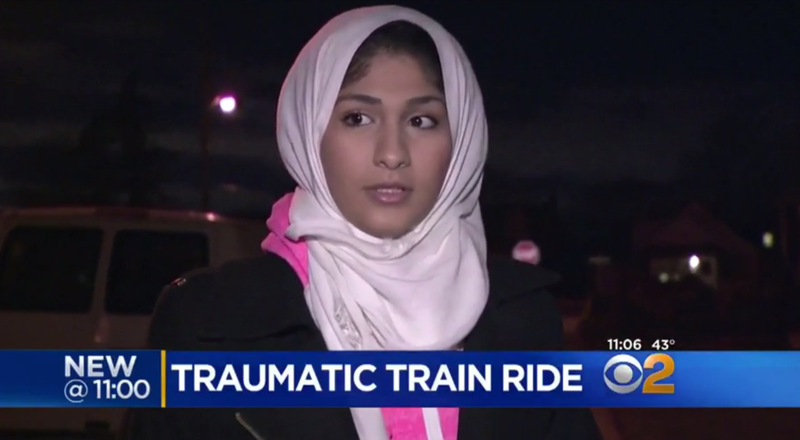 Yasmin Seweid, 18, was still shaken by the traumatic train ride, CBS New York reports. Around 10 p.m. Thursday, she got on the 6 train at East 23rd Street and Park Avenue after leaving a school event at Baruch College. Seweid said she was then verbally attacked by the three drunk, white men. Seweid said no one stopped the men, not even when they tried to tear off her hijab. The Brooklyn born woman, and proud American citizen, was horrified by what happened, and worried it could happen again. “The president-elect just promotes this stuff and is very anti-Muslim, very Islamophobic, and he’s just condoning it,” she said. The NYPD said the Hate Crimes Task Force is investigating and looking for witnesses to identify the men. Meanwhile, Seweid said she plans to continue taking the subway.